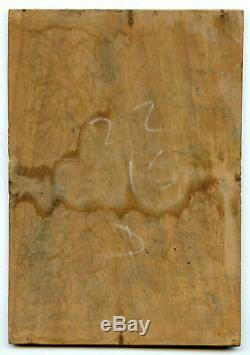 Original oil painting on wood panel, signed by hand in the lower left corner l. State: see photographs; good; slight imperfections at the edge of the panel. Dimensions: 22,1x15,6 cm. Free hand delivery possible to paris by appointment. The work is sold accompanied by an invoice with a detailed description. Original oil painting on wood panel, hand-signed l.
Dupuis at the bottom left corner. Conditions: see photographs; good; slight defects at panel borders. Sizes: 22,1x15,6 cm. Eugen Galen-laloue, common name eugenic gallien laloue, also known as pseudonyms. Famous for its urban landscapes. His father, the theater painter charles laloue, married marie eudoxie lambert to. 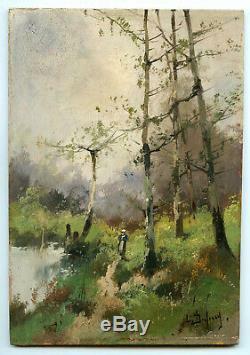 Laloue was born December 11 of the following year at. He is baptized in the following January in the parish. He is the pupil of. Of which he is influenced but not part of it. His father dies and he has to leave school to look for work, being the eldest of a family of nine boys. His mother places him at a notary's. Cheating on his age, he makes a commitment to do so. He is recruited by the. To draw the route of the rails of Paris to the stations of province; he takes the opportunity to paint the surrounding landscapes, then the. Of which it produces a considerable number of gouaches, taking care to respect the layout of the. It varies the tone of the sky, the appearance of trees and lighting according to the seasons by animating the places of characters, particularly fond of the effects of wet sidewalks in the rain or snow. His work is also closely linked to the landscapes of villages in the Ile-de-France countryside. In 1874, he stayed at. Where he paints sunsets and sunrises, as well as scenes of poultry yards, farm courts at. Artist who will not make a career, but whose galen-laloue eugenes will take the name as a pseudonym, giving it a second life to make it known artistic circles. On the Montmartre hill, he paints. The Montmartre fair, Place Pigalle, and the Sacré-Coeur site. He married the second wife of his first wife, Ernest Bardin, who gave him a daughter, Flora Marie Agnès, the. That same year, he works at. But its solitary nature does not accord with this place. At the declaration of the. He was not mobilized because of his voluntary commitment in 1870 and his age, but he made many drawings, watercolors military scenes in. His daughter leaves the paternal home after her marriage in. He marries then with the third on his previous wives, clear bardin, in. He moves to his flora daughter's house. He leaves in exodus to. Can no longer paint because of a broken arm. In the country house of his daughter, at, and is buried in the communal cemetery. The pictorial production of this artist, under his name or pseudonym, was plethoric, and his commercial success attracted imitators whose pastiches are common in the art market. He owned two workshops in Montmartre: one in. Where he is active in. In 1906, he moved to Fontainebleau. The item "Galen-laloue eugene oil on panel signed Dupuis handsigned oil on wood" is on sale since Thursday, April 4, 2019. It is in the category "art, antiquities \ art of the twentieth, contemporary \ paintings". The seller is "art-capital-paris" and is located in / in paris. This item can be delivered anywhere in the world.